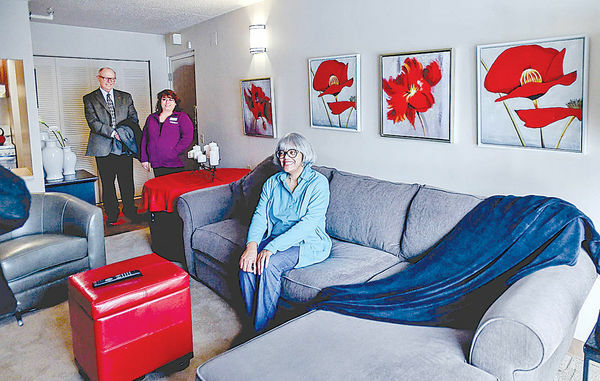 Southfield Mayor Ken Siver and Michele Henderson, manager of Lockwood @ McDonnell Towers Apartments stand in the background of Bernadine Miller’s 3rd floor apartment. SOUTHFIELD — Southfield officials say they have long been focused on creating an enriched community that welcomes everyone — young and old. According to Karen Schrock, chair of the Southfield Commission on Senior Adults, the city has recently bumped up efforts to provide resources for its aging population. COSA is a city-led organization whose goal is to present recommendations and information to the mayor and the City Council based on studies and investigations to help the city address the needs, concerns and problems of senior adults living in the Southfield community. The group also works closely with city departments and local agencies that serve the senior community, monitors state and federal legislation, and serves as an educational link to services and resources, officials said.